Throwback Thursday "Vintage Wedding Fashion"
Our Throwback Thursday photo is a gorgeous vintage wedding. I think this may be my Mom's Aunt on her Mother's side, but I am not sure. I have so many of these fabulous old photos, but many of them do not say the names in the photo. I can recognize many of them, but old ones like this I get a bit lost. How gorgeous is her headpiece? 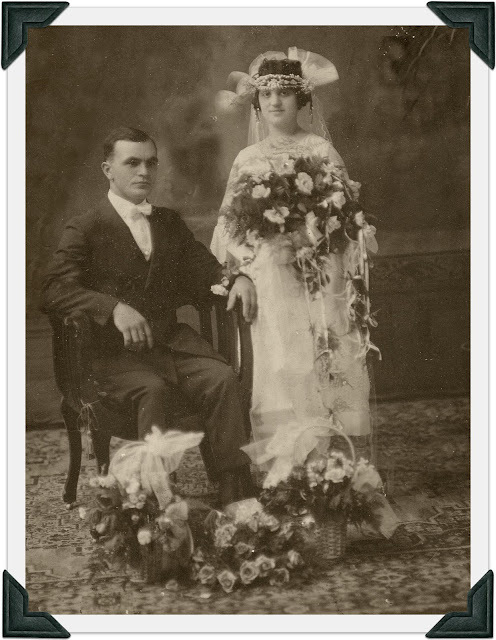 The weddings in the early 1900's had the most gorgeous flowers and fashion. I had to do a bit of work on this photo as it had some issues due to the age, but I think it came out really well. I hope you have a most amazing Thursday! !